Nelson Lakes National Park, situated in the northernmost range of the awe-inspiring Southern Alps, features more than 253,000 acres of serene valleys of native old-growth honeydew beech forest tucked within the folds of majestic mountains, miles and miles of pristine glacial streams, and two of the largest lakes in New Zealand. 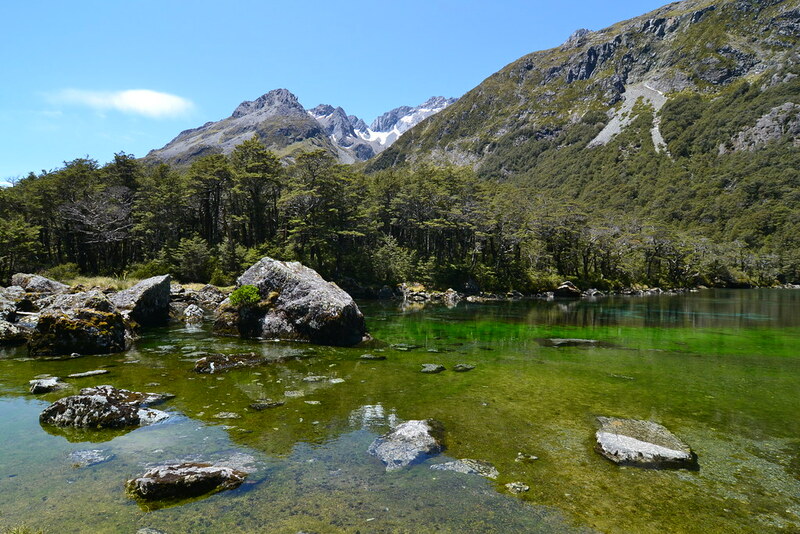 Within the park, Rotomairewhenua, known locally as Blue Lake, holds the international distinction of being the world’s clearest and cleanest lake. Scientific tests conducted by New Zealand’s National Institute of Water and Atmospheric Research (NIWA) revealed Blue Lake to be the clearest natural body of water on the planet. The NIWA research indicated visibility in the lake is up to 252-feet, showing the clarity of the water equivalent to distilled water. Nelson Lakes National Park in the north of New Zealand’s South Island boasts a reputation as one of the world’s most enchanting pristine alpine landscapes. There’s more to do here than you can fit in a day: easy lakeside strolls, challenging mountainous hikes, fly fishing, snorkeling, swimming, kayaking, wind surfing, boating, bird watching, mountain biking, snow skiing, picnicking, and family camping. Breathtakingly beautiful, the park has something to offer for everyone, young and old. Ancient Maori mythology claims Lake Rotoroa (large waters) and Lake Rotoiti (small waters) are massive holes dug by high chief Rakaihaitu with his sacred ko or digging tool. Both of the crystal-clear lakes, cradled by rugged mountains, are fringed to the shoreline with dense honeydew beech forests, home to a diverse array of nectar-eating native song birds. The forests, composed primarily of silver and red beech at lower elevations and mountain beech at higher elevations, are home to an abundance of colorful birds like tomtits, and New Zealand’s tiniest bird, the rifleman. The timberline, where the forest surrenders to alpine plants, is a defining feature of the park, as uniform and abrupt as a razor cut. The honeydew, produced by scale insects, is formed in tiny droplets that hang from the end thread-like tubes that protrude from the trunks of the trees. For the many species of native birds including kaka, kakariki and bush robins, bats, insects, lizards, snakes, and giant snails that frequent the forest, the sweet honeydew syrup is a primary source of high-energy food. Every two-to-six years, the verdant beech forest produces massive amounts of seed that abundantly supplement the diet of seed-eating birds, mice, marmots and ground squirrels. The park presents a complex network of miles of easy and accessible pathways and trails suitable for all levels of fitness and experience. Day walkers can follow fitness level marked trails to enjoy the forest and view the lakes. Many paths and viewing points provide easy access for persons with limited mobility. Hikers up for the daunting trail report the three-day trek to Lake Angelus and back offers jaw-dropping vistas and an unforgettable eco-adventure well worth the effort. When exploring the park, hikers are advised to remember to bring sunscreen, insect repellent, a hat, sturdy hiking boots, and no matter how bright and sunny the weather at the trailhead, warm foul-weather gear. The weather changes dramatically in the mountains. Before setting out, trekkers should check park advisory notices for trail closures and weather advisories. 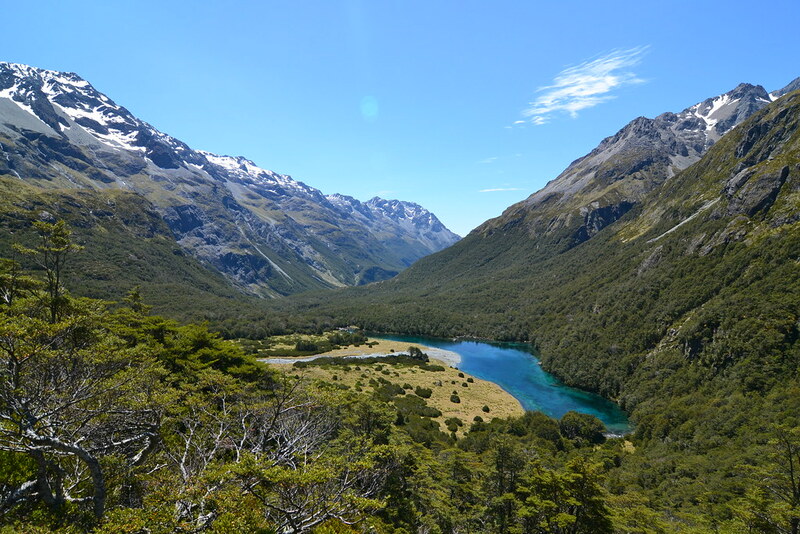 Experienced hikers report the five-day hike about the Travers-Sabine circuit provides stellar mountain vistas, an arduous climb over a high alpine pass, mountain meadows blanketed with brilliant wildflowers, multiple mountain lakes, and some of New Zealand’s best trout fishing destinations. A great many sparking mountain streams, tranquil valley rivers and icy cold alpine lakes within the park are accessible by roadway. Located at La Rotoroa, the classic 1920s fishing lodge is an ideal base for anglers in pursuit of the elusive brown trout. Commanding a position of pride high above the quaint mountain village of St. Arnaud, Rainbow Ski Field offers several types of challenging terrain for adventurous snowboarders and skiers. For skiers, both downhill slopes and cross-country trails present a broad range of outstanding winter recreational opportunities. The majority of the land within Nelson Lakes National Park is preserved and heavily protected, offering the visitor a view of New Zealand as it was more than 500 years ago. Tramps through the wilderness are characterized by intimidating, rough terrain offset by spectacular views. To accommodate public use, some sections of the park offer groomed trails, bridges and Department of Conservation shelter huts. Stylish restaurants, unique shops, upscale bed and breakfast boutique hotels and public transportation are available in the nearby village of St. Arnaud.